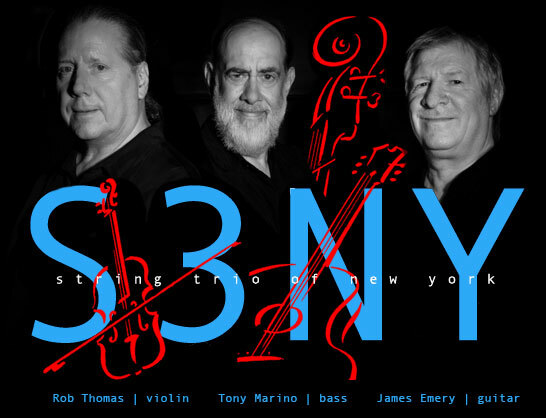 Spawned from the richly diverse adventurous music scene on New York’s Lower East Side in 1977, the String Trio of New York (S3NY) delights, surprises and inspires audiences around the world with its outstanding improvisations upon unique compositions for acoustic violin, guitar and bass. The group is one of the most venerable of the original late 20th century ensembles playing new music informed by the jazz tradition. A true pioneer of the genre-busting, unclassifiable music that blossomed in New York in the 1980s – and which is currently appealing to new and diverse audiences on the performing arts scene - S3NY forged the path for future explorers, combining jazz, western classical, world-music and experimental forms into a cohesive palette of sonic textures and adventurous energy that opened the ears and minds of the public for what eventually became known as New York’s Downtown Sound. Concert performances take the listener on a multi-faceted journey, guiding audiences of all ages and backgrounds on a voyage through a broad and deep repertoire of original works, commissioned pieces by diverse jazz and contemporary music composers, and original arrangements of classic jazz compositions. The compelling and dynamic blend of improvisational excitement coupled with the sensibility of chamber ensemble interplay is an essential part of the ensemble’s live concert experience. Entering its fifth decade of consistent activity in 2018, their hundreds of worldwide performances and seventeen award-winning recordings attest to the depth of spirit and commitment S3NY offers. The extremely rich history of live performance includes appearances at many of the country’s foremost concert series - Great Performers at Lincoln Center, the Kennedy Center, Wolf Trap, Houston’s Da Camera Society, Stanford Lively Arts, Spivey Hall in Atlanta, San Francisco’s Herbst Theatre, the Wexner Center, the University Musical Society in Ann Arbor, among so many others - as well as scores of performances internationally at notable venues and festivals in Europe, East Asia, India and Africa. Additionally, the ensemble has been featured in various media outlets, including National Public Radio’s Weekend Edition and on Public Radio International’s Concerts from the Library of Congress. Players of bowed stringed instruments have the opportunity to study the jazz language, learning how to make stylistically appropriate bowing, phrasing and articulation choices. Strategies for acquiring vocabulary and harmonic understanding are presented, with an emphasis on familiar techniques and practice methods shared by both the classical and jazz traditions - coached by S3NY’s violinist Rob Thomas. It’s S3NY’s intention that all of its educational activities be confluent and supportive of the focus of each institution and its specific teachers. Teachers in the Music Department can select any combination of workshops and activities from the full menu (hyperlinked) or can work directly with S3NY to develop custom activities that will be most effective for each teacher’s plans. S3NY also offers residency activities developed specifically for high school students and for non-music students. These materials are available upon request. The following activities have been conceived as productive and enriching workshop activities for music students in higher education. They can be selected as individual workshops or as part of an extended residency. 3NY also will work with teachers to craft customized programs upon request. In this lecture/demonstration, S3NY will explore various aspects of improvisation, from traditional approaches to the multi-dimensional forms of the present day. This program is abundantly illustrated through improvisations on original works by the members and others. Various types of collective improvisation as well as "textural improvisation" will also be demonstrated and discussed. Members of the Trio listen to student ensembles and soloists and offer observations, critique and advice. The Trio also performs and discusses their approaches to various styles of jazz and improvised music fielding questions as well. All three members of the S3NY are world-renowned composers. Hear insights into development of new repertoire, commissioning and recording new works. Explore the technical and emotional side of composition in jazz and chamber forms. A general discussion of the String Trio of New York's history, repertoire, development, roles and functions of each instrument; includes performances of diverse compositions demonstrating various facets of their repertoire. A chronological demonstration of the growth and development of jazz in the 20th century. This informative and thought-provoking lecture/discussion features performances of works by Duke Ellington, Charlie Parker, Thelonious Monk, Charles Mingus, Miles Davis, John Coltrane and others, tracing the development of the music to the present time. In this for-all-ages program, the String Trio of New York discusses and demonstrates their instruments, their approaches to improvisation, and the basic building blocks of music (harmony, rhythm and melody) in a fun, interactive performance that will have everyone dancing in their seats. – J. Randall Groves, Prof. of Humanities, Ferris State University, Big Rapids, MI.